Brewed in the classic Belgian Witbier tradition, Thomas Kemper White is an unfiltered ale spiced with coriander seed and dried Curacao orange peel, as well as a third proprietary spice. As a side note, the beer we've sent you this month is the brewery's first-ever ale and consistent with their existing product line, it's a winner as evidenced by taking the Silver at the 1995 Great American Beer Festival in the Belgian Specialty Ales category. Rande uses a combination of two-row pale and wheat malts, coupled with unmalted wheat and rolled oats to brew their interpretation of a Belgian Witbier. Liberty hops are the only hops used to brew Kemper White and they are used primarily to add bitterness. Kemper uses a proprietary Belgian Witbier yeast strain. We can't praise the brewery enough for producing such an excellent example of a style that is very difficult to brew. Immediately note the coriander and orange citrus in this clean, prominent nose. Color is pale, slightly cloudy (bottle conditioned) which is appropriate to style. Look for a complex, delicate flavor profile in this beer, one that's spicy, citrusy, and fruity. Also note an extremely dry finish in this medium-bodied Wit. Overall, a superb effort at a Belgian Wit and although it's not Belgian, we'd enthusiastically sample it again just to make sure we got it right for Microbrewed Beer of the Month Club! Founded in 1985 by Andy Thomas and Will Kemper, The Thomas Kemper Brewing Co. was one of the country's earliest specialty brewers. Located across Puget Sound from Seattle, WA, the brewery adopted a bold strategy early on by choosing to brew authentic German lagers and Bavarian wheat beers in a region typically dominated by ale breweries. Brewmaster Rande Reed is at the heart and soul of Kemper's product line. Traveling from his home in Milwaukee, WI to Europe in 1979 sparked the interest in brewing that all but obsesses Reed today. With only a limited background in wine making and little documented literature at the time on brewing, he sought out information and advice from brewers themselves and by 1982 was considered to be an authority on home brewing as he began speaking at conferences around the country. Reed was hired in 1989 to help the brewery in improving and maintaining their inconsistent product line. He is now considered to be a significant authority within the industry, respected widely amongst his peers for his innovative and high quality products. For more information about the brewery and scheduled tours, call (206) 682-8322 or check out their web site at www.thomaskemper.com. Whether grilled, broiled, steamed or fried, whitefish is a natural match for crisp, clean lagers of either the Bohemian or German variety. The crispness of the beer, combined with whatever delicacies each individual beer may offer, will provide the perfect complement to the delicate, melt-in-your-mouth qualities of a beautifully cooked fish. 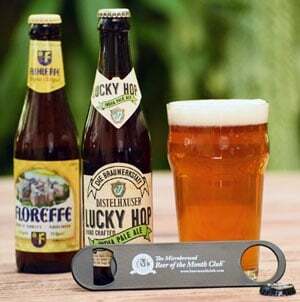 Although you should use a lager in the recipe itself, consider serving the meal with a Pilsener, an ale, or this month's featured lager. Wash and clean trout, place in saucepan. Mix beer, wine, vinegar and pour over fish in saucepan. Heat mixture to boil, turn down heat and simmer 10-15 minutes, turning fish over. Remove fish, squeeze lemon over fish, garnish with lemon slices and parsley. Serves 3 persons, 2 persons and 3 cats, 2 persons and one cat with an overactive pituitary gland, or one dog. Source: Great Cooking with Beer, Jack Erickson, Red Brick Press, 1989. JUiCE MAGAZINE - After consuming stale bread and dough, 3 Vermont cows died of alcohol poisoning. Investigators believe unbaked dough yeasts reacted with the partially digested material in the cow's stomachs to produce alcohol. Rumor has it that the Pabst Brewing Co. is investigating the viability of this previously uncharted brewing technique with plans to market it as "Pabst Blue Bovine: The Brew that makes you Moo." SECRET LIFE OF BEER - Among the forest tribes of Latin America the practice of exocannibalism, or the eating of one's enemies, was commonly combined with brewing and drinking beer. Legend has it that you couldn't beat the taste of human fingers with a cool skull cup of chicha beer. The Putumayo River tribes ate captives only after an eight-day beer festival where the prisoners, soon to be consumed, were kept drunk until meal time. (next sentence in italics) These guys take the phrase, "marinating your liver" to an entirely new level! BEER TRIVIA - The concept of the 6-pack was developed over the 4, 8 or 10-pack in the 1930's when major brewing companies determined that six bottles of beer was the maximum number that a woman could carry home from the market at one time. I was kickin' back in my favorite blues bar, the New Dolphin Inn, last weekend and decided to venture out and try one of several malt liquors that were on hand behind the bar. Several things followed my consumption of a couple of tall boys: I found rhythm and became a dancing machine, my dance partners looked considerably better than they had only hours before, and I woke the next morning (or perhaps early afternoon) feeling as though I'd been beaten up side the head repeatedly with a large, blunt instrument. My question is a simple one. What the hell is a "malt liquor"? Is it different from beer and why don't I ever want to have one again? Good question. There seems to be much confusion with respect to the difference between a malt liquors and malt beverages. To answer your question, I've got to first let you know that the phrase, "malt liquor" is really just another marketing tool used to describe a category of beers that could be described as "fortified Bud". All malt liquors are also malt beverages. 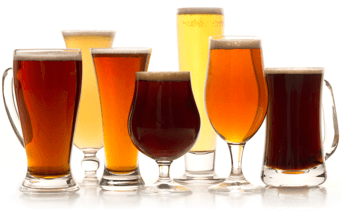 In many states, any malted beverage above 4 % alcohol by volume cannot be labeled as "Beer". As what has become to be known as "malt liquor" is not really a stout, porter, ale, or any of the other style descriptors that could be used instead of the word "beer", the phrase malt liquor was developed. Your basic Cobra Malt Liquors and Old English 800s of the world are brewed with more fermentables such as sugars and adjunct grains like rice and corn. Bottom line? Cheaply produced, high octane rocket fuel that would serve you equally as effective and perhaps more kindly the next morning as a rust remover rather than a social lubricant. Bit of trivia on the two above mentioned products: Old English originally got its name as it used to contain 8 % alcohol by volume. Cobra got its name after product research uncovered excessive consumption of the product to serve as an effective repellent towards the obviously highly intelligent reptile.